Galton was a naturalist, statistician, and evolutionary theorist. He was a second cousin of Darwin’s, having descended from his grandfather, Erasmus. Born in Birmingham in 1822, Galton studied medicine at King’s College, London, and also read mathematics at Trinity College, Cambridge. On inheriting a large fortune from his father, he abandoned medicine, which he disliked, indulged in travel and sport, and then financed his own expedition to southwest Africa (1850-52), completing a natural historical narrative of the journey (Galton 1853). Darwin enjoyed and admired Galton’s book, and reintroduced himself to his cousin, later seeking information on domestic animals in Africa. On receiving a copy of Origin, Galton remarked that reading the book was like being ‘initiated into an entirely new province of knowledge’ (9 December 1859). He soon became interested in patterns and mechanisms of inheritance, writing a preliminary paper on hereditary talent in 1865. This was later expanded into the book, Hereditary Genius (1869), which contained an entry on the Darwin family, including the “author of the Theory of Natural Selection”, two of Darwin’s sons (George and Leonard) who had distinguished themselves in exams, and (alluding perhaps to himself) “others of the family who, in a lesser but yet decided degree, have shown a taste for subjects of natural history”. Shortly after Darwin published his preliminary hypothesis of pangenesis in Variation (1868), Galton began a series of experiments on rabbits to test the theory. He reported regularly to Darwin on these experiments, which involved transfusing blood between differently coloured varieties, usually to little or no effect: “Two more litters & no happy results”, he wrote on 26 April 1870. 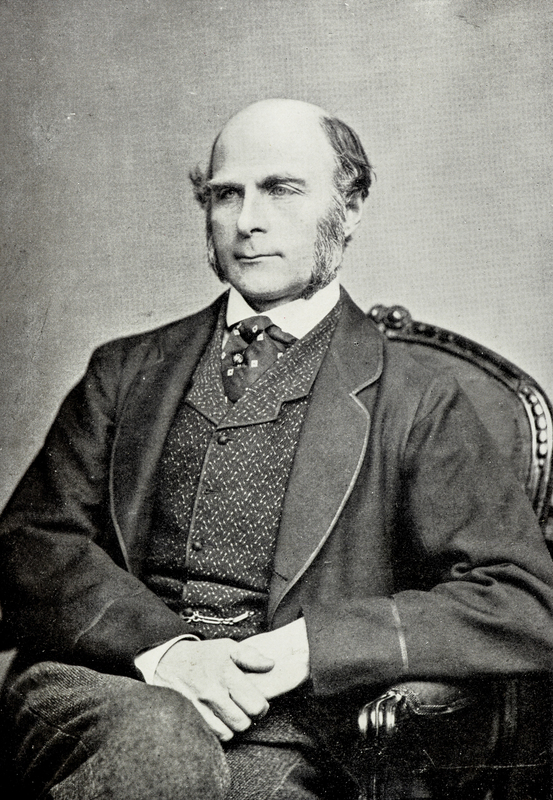 In the following year, Galton delivered a paper to the Royal Society claiming that his results tended to disprove Darwin’s theory (Galton 1871). This brought a quick rejoinder from Darwin, who believed his cousin had mistakenly assumed hereditary material to be transmitted through the blood. Galton resumed his experiments with enthusiasm, describing in graphic detail how he was employing a surgical assistant to ‘siamese’ the animals together to facilitate cross-circulation (13 September 1871). His views on inheritance continued to diverge from Darwin’s, however. He studied cases of twins and intellectual ability across generations in families, and came to reject the inheritance of acquired characteristics, arguing instead that hereditary material was stored exclusively in the reproductive organs, isolated from the effects of environment or habit. Galton shared his views in several lengthy letters, but Darwin struggled with the abstract reasoning and terminology, and sought help from his mathematician son George, who shared Galton’s more statistical approach to heredity. Having dismissed the effects of culture on inborn nature, Galton went on to develop elaborate ways of identifying human traits and testing mental abilities, drawing on new technologies of measurement and classification, including photography, anthropometry, and fingerprinting. In 1873, he proposed founding a society to gather information on inheritance, including a national register of hereditary diseases and infirmities, with the aim of improving the population. Darwin was less optimistic about such a programme, “the greatest difficulty, I think, wd. be in deciding who deserved to be on the register. How few are above mediocrity in health, strength, morals & intellect; & how difficult to judge on these latter heads” (4 January ). Like most of his contemporaries, Darwin continued to believe in the inheritance of acquired characteristics, and emphasized the importance of individual circumstances and hard work in human achievement. In response to a questionnaire that Galton prepared for his book English men of science: their nature and nurture (Galton 1874), Darwin insisted that he had no particular inherited talents, except for business (28 May 1873). Galton grew increasingly concerned about the fitness of the English nation through the over-breeding of the lower or inferior classes, and remained dedicated to the improvement of the population through selective breeding, coining the term ‘eugenics’ in 1883, and founding the Eugenics Research Office at University College, London in 1904. He died in 1911, having spent most of his life in London. Galton, Francis. 1853.The narrative of an explorer in tropical South Africa.London: John Murray. Galton, Francis. 1869.Hereditary genius: an inquiry into its laws and consequences.London: Macmillan. Galton, Francis. 1871. Experiments in pangenesis, by breeding from rabbits of a pure variety, into whose circulation blood taken from other varieties had previously been largely transfused. [Read 30 March 1871. ]Proceedings of the Royal Society of London19 (1870–1): 393–410. Galton, Francis. 1874.English men of science: their nature and nurture.London: Macmillan and Co.
Congratulates CD onOrigin; has been "initiated into an entirely new province of knowledge". Rabbits still running true; hopes to increase alien blood to 30%. Replies to Francis Galton’s paper on tranfusing blood between rabbits to test Pangenesis [Proc. R. Soc. Lond.19 (1871): 393–40]. FG’s conclusion that his experiments prove Pangenesis to be false is "a little hasty", since CD had never maintained that gemmules in the blood formed any part of his hypothesis. Is turning to experiments with rats, "Siamesed together" for cross-circulation. Comments on FG’s article ["Hereditary improvement",Fraser’s Mag.87 (1873): 116–30]. Finds it "the sole feasible, yet I fear utopian, plan of procedure in improving the human race". Mentions reading W. R. Greg’sEnigmas[of life(1872)]. In London yesterday for Vivisection Commission. Is revising his chapter on Pangenesis [inVariation, 2d ed.] to allow that gemmules probably multiply in the reproductive organs. Notes examples of inheritance of acquired characteristics cited by Brown-Séquard. Doubts that double parentage is necessary for complex organisations. Comments on FG’s paper ["A theory of heredity"]. Finds essay difficult to understand. Objects that FG’s theory conflicts with phenomenon of use and disuse. Conflicts also with rarity of bud-variations in nature. Says he has ordered FG’s article ["The history of twins",Fraser’s Mag.92 (1875): 566–76; revised inJ. Anthropol. Inst.5 (1876): 391–406]. Traveller, statistician, and scientific writer. Son of Samuel Tertius Galton and Violetta Galton, née Darwin; CD’s cousin. Explored in south-western Africa, 1850–2. Carried out various researches on heredity. Founder of the eugenics movement. FRS 1860.